Book launch and author reading: Hello, Australia! 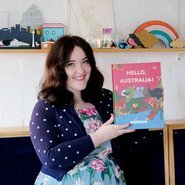 Join Megan McKean, the creative force behind beloved children’s books Hello, Sydney! and Hello, Melbourne! as she launches the much-anticipated third book in the series, Hello, Australia! In this latest look-and-find adventure, you’ll embark on a trip around Australia with a bunch of cheeky galahs to discover more about the animals, birds and plants that live here. Along the way, you’ll meet some very friendly quokkas, take a ferry to Kangaroo Island, marvel at the Big Things and learn about some places that are sacred to the traditional owners of the land. From sunny Queensland to the ski fields of Victoria, there’s so much to see and do around Australia. Megan will be reading from Hello, Australia! and the first 100 copies sold will come with a limited-edition mini-print based on her vibrant and quirky illustrations. The Gallery Shop is also thrilled to be stocking the new product range Land of the Rainbow Gold from Megan’s design label McKean Studio. In honour of the launch, McKean Studios has created an exclusive lapel pin: an iconic Aussie animal with an arty embellishment. Drop in for the celebrations and get your paws on one before anyone else! You can pre-order your copy of Hello, Australia! with limited-edition mini-print, for collection on the day.